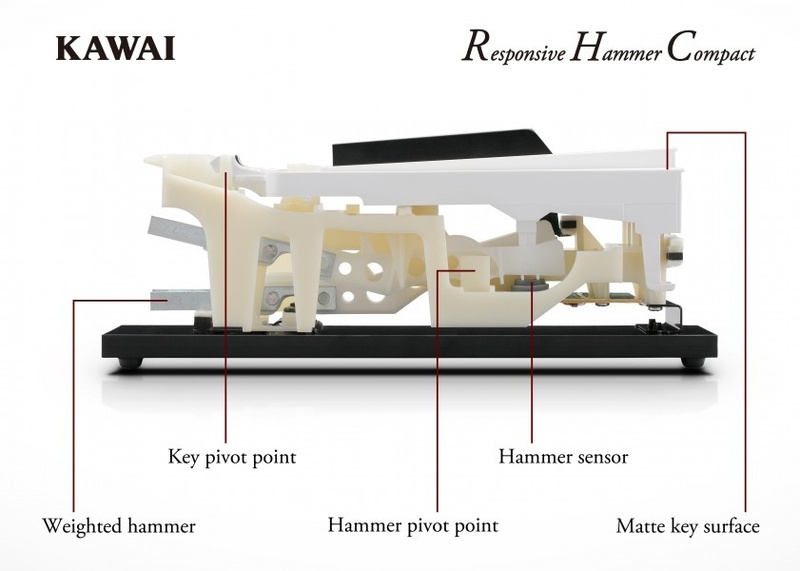 An excellent introduction to Kawai’s portable piano line-up. 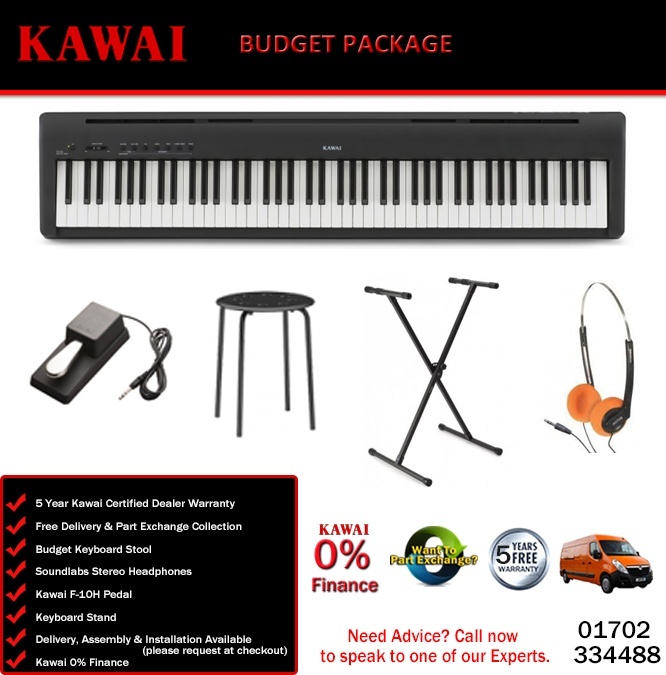 The ES 110 is the latest addition to Kawai’s highly respected series of portable digital pianos, combining our class-leading authentic keyboard action and piano sound technologies within a lightweight, affordable package. Realistic touch, natural motion. The ES 110’s brand new Responsive Hammer Compact keyboard action has been developed to reproduce the distinctive touch of an acoustic grand piano. Ist spring-less technology and sturdy construction delivers consistent upward and downward motion for a smooth, natural, and highly authentic piano playing experience. Featuring 88 grade-weighted keys, the ES 110 keyboard responds just like a real grand piano, and is therefore an ideal choice for beginners seeking a starter instrument on which to learn. However, its realistic, acoustic-like touch will also appeal to more experienced players looking for a second piano for after-hours practise, or to simply enjoy a little music away from home. True character in every note. The ES 110 digital piano captures the beautiful sound of Kawai’s highly acclaimed concert grand piano, with all 88 keys of this exceptional instrument meticulously recorded, analysed and faithfully reproduced using advanced Harmonic Imaging technology. This unique process accurately recreates the broad dynamic range of the original grand piano, affording pianists an extraordinary level of expressiveness ranging from the softest pianissimo to the strongest, boldest fortissimo. Reverbs, noises, & resonances. Additional reverberation effects that simulate the acoustic environment of a recital room, live stage, or concert hall are also applied, with settings to adjust voicing, sympathetic resonance, and other acoustic characteristics. The result is a rich, vibrant piano tone that delivers breathtaking realism and authenticity. Inspiring features. Moreover, the impressive ES 110 also offers a variety of useful features to complement its authentic keyboard touch and rich grand piano sounds. The built-in lesson function, with adjustable metronome and song recorder, is an invaluable tool for aspiring pianists, while additional instrument voices, Dual and Split playing modes, and 100 drum rhythms allow players of all levels to indulge their creative spirit. Line Out jacks. Weighing just 12 kilos, the ES 110 is ideal for gigging musicians looking for a portable instrument with authentic touch and high quality sounds. Dedicated Line Out jacks allow direct connection to mixers and PAs, with the ability to leave the built-in speakers enabled for use as local monitors. Bluetooth connectivity. In addition to standard MIDI ports, the ES 110 also boasts integrated Bluetooth MIDI, allowing the instrument to communicate with smart devices wirelessly. Once paired with a phone or tablet, ES 110 owners can easily expand the piano’s functions using a wide range of music apps – without the need for any extra cables or adaptors. Optional stand & triple pedals. Transform the ES 110 into an ultra-compact piano replacement suitable for any room with the matching HML-1 stand and F-350 triple pedal accessories.